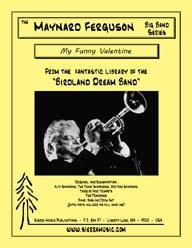 Sierra continues to find the lost treasures from Maynard Ferguson's Birdland Dream Band Library. This chart is a blast! It is one of the more popular charts from Maynard's Birdland Dream Band. As recorded on "Maynard Ferguson Plays Jazz For Dancing" (Roulette), this may be the prettiest chart that Willie did for Maynard's band. Short, sweet and swingin'! Willie Maiden's arrangement of "I'll Be Seeing You" packs a whopper in a tiny box, making this chart perfect as an encoure closer for any set. As recorded by Maynard Ferguson and his orchestra on the album Dancing Sessions, Willie's arrangement makes great use of the trombone section as they carry the melody upfront before passing it around to the rest of the band. It Could Happen To You is one of the best known standard tunes, and this arrangement certainly does it justice. The Pro (original) version of "It Could Happen To You" is absolutely wonderful. 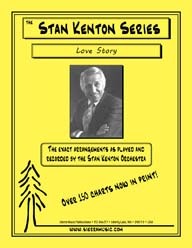 This great Kenton classic, as recorded on the album "Live from Redlands University," is a swinging, happy chart which allows for lots of blowing space and is combined with great ensemble sections. As recorded by the Stan Kenton Orchestra on "Live at Brigham Young University," this may well be Willie's best chart done for Stan. This absolutely beautiful arrangement by Willie Maiden features a trombone and tenor sax solo, along with the primary solo by (guess who) the trumpet player a la Maynard. As recorded by the Maynard Ferguson Orchestra on the "Newport" album, this clever Willie Maiden arrangement is set in three sections - ballad, medium swing and fast swing. This is a gorgeous ballad arranged by Willie Maiden for the great Maynard Ferguson Orchestra and is included in "The Complete Roulette Recordings” (Mosaic). Written for and recorded by the Maynard Ferguson Birdland Dream Band, this chart by Willie Maiden is uncharacteristically easy to play for the band due to very reasonable brass ranges. This "edited" version of "Where's Teddy" (as played and recorded by Maynard Ferguson's Birdland Dream Band) is much more playable for the trumpet section as a whole than the original "pro" version (which is also available). This is the original chart as played and recorded by Maynard Ferguson's Birdland Dream Band.